The ALPFA Stillman Business Club ran a very impressive event (a male athlete pageant show) that acted as a fundraiser for the Save the Children foundation, and ALPFA’s summer convention. For those who do not know, the Save the Children foundation is responsible for protecting and transforming the lives of children around the world. The summer convention is a networking event held by the national organization of ALPFA to help get their members networking experience with professionals in all disciplines of the business world. This organization further demonstrated the continuous effort from the Stillman Business School community to give back in all areas. Stillman prides itself on having students who are ethical and servant leaders all which were demonstrated in the planning and organizing of this athlete pageant. Treasurer, Sarah Ebady was the one who proposed the idea of a male athlete pageant show. She is currently studying abroad in London. As fundraisers go, Mr. Seton Hall was innovative and entertaining. Such fundraisers demonstrate the creative minds of the ALPFA club’s ability to raise awareness for charity organizations all while entertaining the student body. The pageant judges were Dean Strawser, Dean Passaro, who serves as the ALPFA executive secretary, and Morgan Stanley professional Sergio Menacho. The evening started out with the Seton Hall Dance Team (SHU Sapphires) presenting an upbeat, synchronized dance. Then the Seton Hall Cheerleaders showed us impressive features of their routine. Some highlights from the evening included athletes from the soccer, rugby, and baseball teams dressing up in their uniform, and then coming out in beachwear, and finally presenting their professional formal business attire. During the intermission between the uniform round and the beachwear, the Seton Hall Indian Fusion dance team (SHU Sitare) mesmerized the audience with their unique dance steps to a remix that encompasses dance styles all around India. Singers Malcolm Luther and Jade Latson sang a wonderful piece in the break between the beachwear round and the question/answer professional round. All candidates were well-rounded men and clearly demonstrated this in their show on the runway. Most of all, the most memorable part of the night was the question and answer session of the contest because the school got to see a new and humbler side of their prized athletes. Each athlete was presented with a different question. One contestant had to describe the best thing about being at Seton Hall, another contestant had to explain one thing they would change if they had the opportunity to go back in the past. 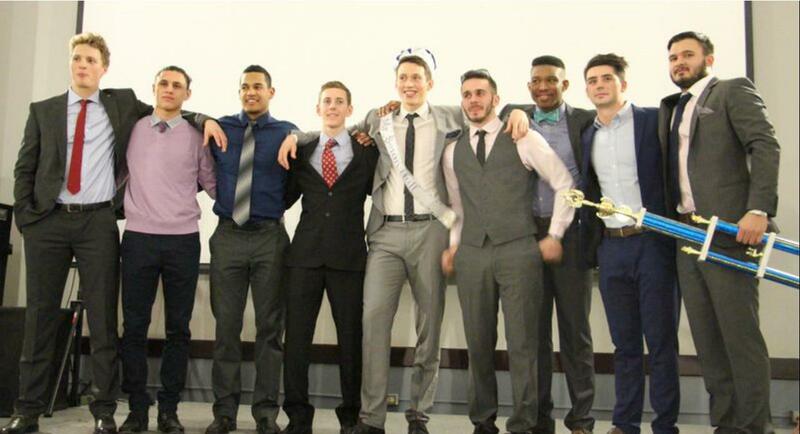 Of all the talented candidates, men’s soccer player, Julian Spindler, a sophomore majoring in finance, was named the winner of the pageant. Overcoming our division’s tough soccer opponents is one thing, but beating out eight other very qualified candidates can be added to Mr. Spindler’s list of accomplishments. Tom Ivezaj, junior, was also recognized with the “Audience Choice” award. Overall, the evening was a huge success for the athletes that participated, the members of ALPFA, and the Stillman community. This event is just one instance of how the Stillman community comes together to support one another.